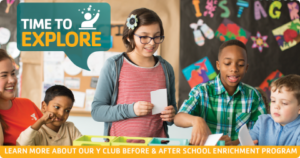 Children can attend the Y Club program at their school beginning at 6:30 a.m. until the beginning of the school day; and after school from dismissal until 6:00 p.m.. Safe, fun, and constructive activities are offered, such as arts and crafts, sports, games, and academic support. All sites are directed by competent, experienced YMCA staff. Policies have been created with the child’s safety as the top priority. For more information, call the CMT YMCA at 618-346-5600 or visit their website. In addition to the before and after school program, the Gateway Region YMCA also offers Y-CLUB SCHOOL’S OUT CLUB on select days when local schools are closed but the YMCA is still open…convenient, safe, affordable care for children of working parents. Parents can check the YMCA branch schedules for more information.